A hundred years ago, before Americans changed their diet and the calamitous events of the 20th century began, heart disease was far less common that it is now. Few Americans were overweight, and coronary heart disease was not yet recognized as an illness. Pneumonia, diarrhea and enteritis, and tuberculosis were the three most common causes of death, whereas coronary heart disease is now the most common cause of death in the United States. The medical subspecialty of cardiology was created in 1940. Since then the number of cardiologists in the U.S. has grown from 500 in 1950 to 30,000 now — a 60-fold increase. While deaths from coronary heart disease (CHD) began to mount, researchers found that they could produce fatty deposits in the arteries of rabbits by feeding them cholesterol. By mid-century 22 countries were keeping records on fat consumption and deaths from CHD. A University of Minnesota public health researcher, Ancel Keys (1904—2004), picked 6 countries (later 7) that showed an almost straight-line correlation between calories from fat in the diet and deaths from heart disease. Japan had the lowest CHD mortality — less than 1 in 1,000 — with the Japanese diet having only 10 percent of its calories coming from fat, whereas the U.S. had the highest CHD mortality — 7 in 1000 — with 40 percent of its calories coming from fat. Government-funded investigators (in 1948) started following some 5,000 men and women in Framingham, Massachusetts to see who developed coronary heart disease. They found that people with elevated cholesterol were more likely to be diagnosed with CHD and die from it. The American Heart Association (in 1956) began promoting the Prudent Diet, where u201Ccorn oil, margarine, chicken, and cold cereal replaced butter, lard, beef, and eggs,u201D as Mary Enig and Sally Fallon describe it in u201CThe Oiling of America,u201D available HERE. By the 1970s the diet-heart idea, known as the lipid hypothesis, had become well established. It contends that 1) saturated fats raise cholesterol blood levels, and 2) cholesterol causes CHD. Next, after several years of hearings, the U.S. Senate Select Committee on Nutrition and Human Needs, chaired by Senator George McGovern, released (in 1977) its u201CDietary Goals for the United States,u201D designed to reduce fat intake and avoid cholesterol-rich foods. These goals have become official government policy. u201CArtery cloggingu201D saturated fats, whose strings of carbon atoms are fully saturated with hydrogen atoms, were said to be especially bad. Animal fat (meat, milk, eggs, butter and cheese) and tropical oils (coconut and palm oil) contain saturated fats. Health authorities advised the American public to avoid them and replace saturated fats with carbohydrates and processed polyunsaturated vegetable oils — soybean, corn, cottonseed, canola, peanut, safflower, and sunflower oils. In 1984, the Center for Science in the Public Interest (CSPI), a consumer advocacy group, joined the fray and started to coerce fast-food restaurants and food companies to stop frying food with animal fats and tropical oils. McDonalds fried its French fries with beef fat and palm oil. That’s why they tasted so good. But CSPI’s well-orchestrated saturated frying fat attack forced McDonalds and other fast-food chains to switch to partially hydrogenated (trans-fat) vegetable oil. Evidence against fat wilts upon close scrutiny. In his Six Country Study, Ancel Keys ignored data available from 16 other countries that did not fall in line with his graph. The results would have been a clutter of dots all over the place if he had included all 22 countries. In Norway and Holland, people eat a lot of fat but have relatively few deaths from heart disease; and in Chile, where people don’t eat much fat they have a high incidence of fatal heart attacks. In an entertaining 2 minutes, u201CBig Fat Liesu201D on YouTube (available HERE) exposes the fraudulent science supporting this widely cited study. Saturated fat may raise cholesterol somewhat, but primarily HDL cholesterol. The ongoing Framingham Heart Study has come to show that fat and cholesterol are, if anything, healthy. A 30-year follow-up reported that for each 1% mg/dl drop in cholesterol there was an 11 percent increase in all-cause mortality (JAMA 1987;257:2176—80). In another report, one director of the Framingham Study states, u201CWe found that the people who ate the most cholesterol, ate the most saturated fat, ate the most calories, weighed the least and were the most physically activeu201D (Arch Int Med 1992;152:1271—2). Moreover, the government-issued u201CDietary Goals for the United Statesu201D did not seek evidence to justify them. For an amusing but disturbing overview of the politics behind these goals see the (2-minute) video u201CThe McGovern Reportu201D on YouTube, available HERE. 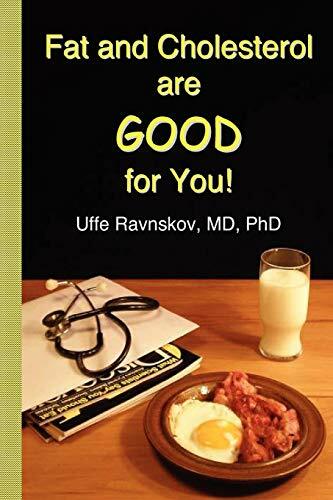 Along with other investigators (see HERE and HERE and HERE), Uffe Ravnskov, M.D., Ph.D., a Swedish cardiologist, explains in a clear and concise fashion why the idea that saturated fats and cholesterol cause heart disease is wrong. In Fat and Cholesterol are Good for You: What Really Causes Heart Disease (2009), he refutes the lipid hypothesis and addresses the economic and political factors that drive the anti-saturated-fat agenda. An epidemic of obesity has accompanied the adoption of a low-fat diet. In 1900 only 1 in 150 people were obese, 0.7 percent of the population. By 1950, 9.7 percent of Americans were obese. Now two-thirds of Americans are either overweight (33 percent) or obese (32 percent). The average American weighs 30 pounds more today than he or she did 100 years ago. In 1900 people ate more animal fat and were not exposed to high amounts of carbohydrates in sugar-rich sodas and fruit juices, and to a whole panoply of processed foods sweetened with high-fructose corn syrup. Mary Enig, Ph.D. and Sally Fallon have written a book that can help Americans shed those extra pounds. 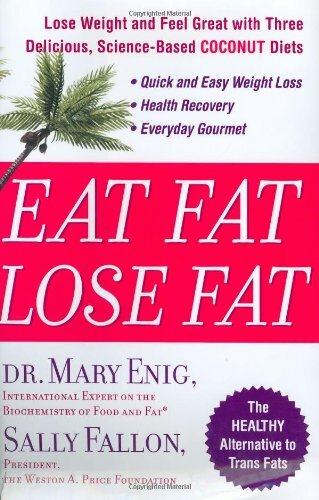 Returning to the type of diet trim Americans had at the beginning of the last century, it is appropriately titled Eat Fat Lose Fat: Lose Weight and Feel Great with Three Delicious, Science-Based Coconut Diets (2005). Saturated fats work best for losing weight. In a randomized, double-blind trial comparing the effects of coconut oil and polyunsaturated vegetable (soybean) oil in women with abdominal obesity, women who consumed coconut oil had a significant reduction in waist circumference (with no change in cholesterol levels). Women taking vegetable oil had no change in their waist size and had a statistically significant increase in LDL cholesterol and reduction in HDL cholesterol (Lipids 2009;44:596—601). In light of scientifically done studies like this, the reader might consider starting the day by drinking one ounce (30 ml) of warmed-up, liquid extra virgin coconut oil mixed with a little fruit juice, especially if overweight. I do (and obtain it HERE). Americans have replaced saturated fat in their diet with processed polyunsaturated vegetable oils and carbohydrates. The Average American drinks 600 cans (56 gallons) of soft drinks a year (up from 216 cans in 1971). One-third of our dietary sugar comes from sodas, which has become the number one source of calories. Each 12-ounce can contains 10 teaspoons of sugar in the form of high-fructose corn syrup. 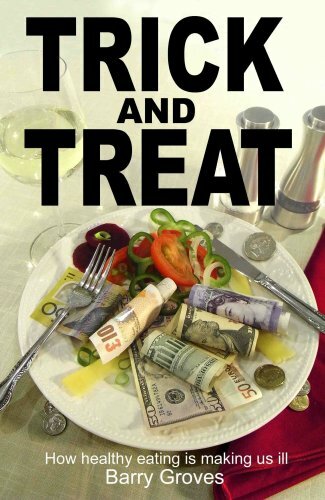 Barry Groves, Ph.D. focuses on the untoward consequences of adopting a high-carbohydrate, high-polyunsaturated vegetable oil, low-saturated fat diet in Trick and Treat: how u201Chealthy eatingu201D is making us ill (2008). As he shows, citing 1,147 references, there is now good evidence that this diet is a major cause of the epidemic of obesity, type-2 diabetes, heart disease, stroke, cancer, and various mental problems (such as depression and senile dementia) that afflict an increasing number of Americans. One of the major health benefits of a low-carbohydrate diet is weight loss. It enables one to lose excess weight without having to consciously restrict calories (Ann Int Med 2004;140:769—777). A low-carb diet lowers blood glucose in diabetics (Diabetes 2004;53:2375—2382). It improves insulin sensitivity (N Engl J Med 2003;348:2074—81). Indeed, carbohydrate restriction (with fat replacing carbohydrates) is on the way to becoming the preferred method for treating type-2 diabetes and its precursor, metabolic syndrome (Scand Cardiovasc J 2008;42:256—263). Restricting carbohydrates can also lower blood pressure (JAMA 2004;292:24822—2490). With growing evidence that fewer carbohydrates in the diet improves health, the much-maligned Atkins diet, first introduced in 1972, has gained new respect (N Engl J Med 2008;359:229—41). 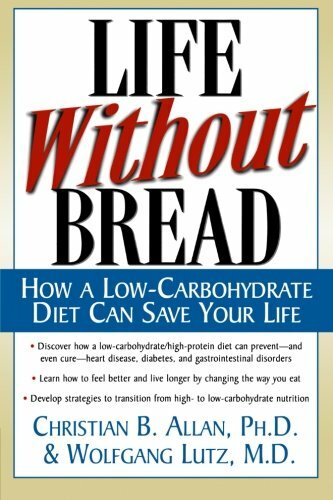 Joel Kaufmann, Ph.D. reviews 12 low-carbohydrate diet books, beginning with Dr. Atkins’ New Diet Revolution (2002), available HERE. For optimum health and weight maintenance, the ideal caloric ratios for the three macronutrients are carbohydrates, 10—15 percent; protein, 15—25 percent; and fat, 60—70 percent of calories. Among the different kinds of fats, saturated fats and monounsaturated fats (olive oil) are good; polyunsaturated fats, except for omega-3 and (a small amount of) omega-6 essential fatty acids, are bad, especially industrially processed vegetable oils; and trans fats are terrible. Saturated animal fat is best obtained from grass-fed beef and pastured chickens, along with nitrate-free, additive-free bacon and sausage; and seafood from wild (not farm-raised) fish. 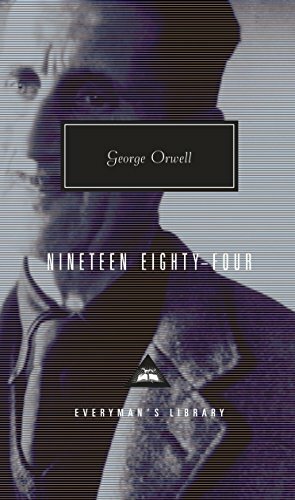 In Nineteen Eighty-Four (1984) George Orwell writes, u201COrthodoxy means not thinking, not needing to think.u201D Reading the four books referenced above will make one think and question the accepted view that saturated fats and cholesterol cause coronary heart disease and that a low-fat (high-carb) diet prevents it. What the two doctors in Woody Allen’s 1973 comedy Sleeper say in 2173 about saturated fats is true. Life does imitate art. Today, Uffe Ravnskov, Mary Enig and Sally Fallon, and Barry Groves, among others are already confirming the truth of these futuristic doctors’ statement. Saturated fats are good for us, and pure butter will once again be viewed as the number-one health food.